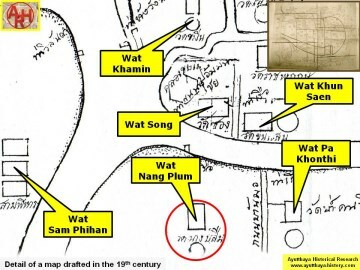 describes the event in an account from 1640 - "The short history of the Kings of Siam". "Mother, and so what if he should hear it? What would it matter if he kills me. what you have on. In the meantime go rest and sleep a little." by the strict laws of the king. Finally, the woman filled a tiny little jug with arak. not make too much noise for the king and have something evil befall you." with their perahus not far from that little house. thinking that His Majesty had heard what happened in her home that night. was the person who had lodged and been cared for at her little house at night. "henceforth I will call you Mother and love you for this." 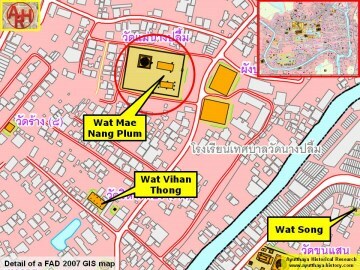 as Wat Mae Nang Plum, in commemoration of the old lady. 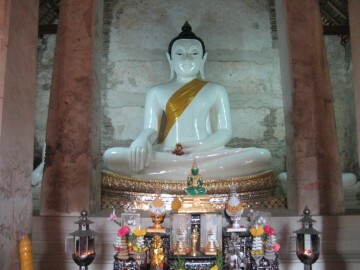 called Phra Pho Khao or White Buddha can be seen. nowhere else seen in Ayutthaya. 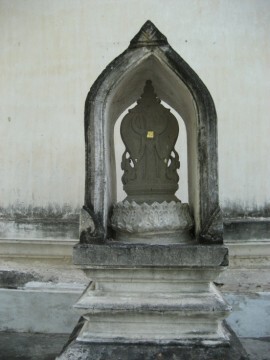 period and based on the Sukhothai style. 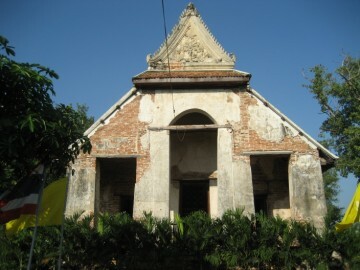 been built or remodeled later than the caitya at Wat Thammikarat. 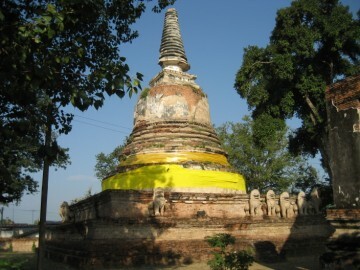 Khonthi. 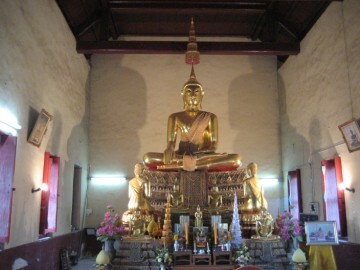 See "The Boat & Ferry Landings of Ayutthaya". figures also on a mid-19th century map. 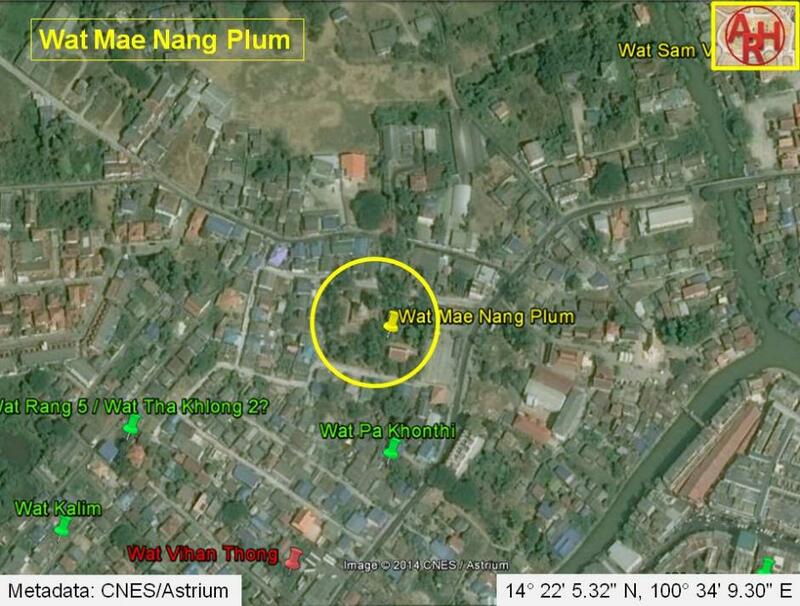 Wat Mae Nang Plum is located in Geo Coord: 14° 22' 5.32" N, 100° 34' 9.30" E.
somehow about sixty year later. 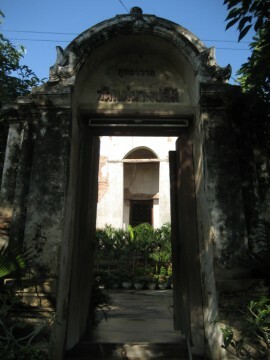 The temple's original name remains unknown. David K. Wyatt (2005) - page 230/231. The Rise of Ayudhya - Charnvit Kasetsiri (1976). 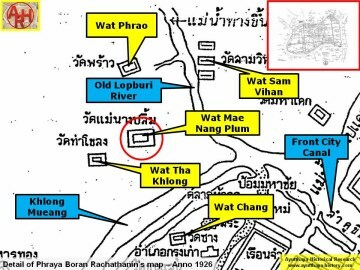 Cakkraphatdiphong & Royal Autograph - Nobles Plot to End Usurpation. Text, maps & photographs by Tricky Vandenberg - September 2009.